The centromere regions in most plant and animal genomes are composed of large arrays of repeat sequences which hamper such regions to be accurately and completely sequenced in genome projects. These regions experience rapid evolutionary changes in respect to sequence turnovers, and are potential hotpots for evolutionary novelties that may contribute to adaption. In a recent study, a group led by Prof. CHEN Mingsheng in the Institute of Genetic and Developmental Biology, Chinese Academy of Sciences, carried out a comprehensive comparative genomic analysis on centromere regions between two Oryza species, O. sativa and O. brachyantha, which diverged ~15 million years ago. This group has completed the whole genome sequence of O. brachyantha with next generation sequencing technology earlier. In the recent study, they targeted to improve the centromeric and pericentromeric regions of this genome using clone-by-clone strategy. They found that O. brachyantha acquired lineage-specific centromeric sequences during its independent evolution. Comparison of these two Oryza genomes revealed extensive pericentromeric inversions which are the main cause for centromere movement. The centromere position of chromosome 12 in O. brachyantha has moved possibly as the result of centromere repositioning triggered by segmental duplication. The researchers also found an excess of gene moving out of centromeric regions, which can be explained by selective loss of gene copies in the centromeric regions after gene duplication driven by the antagonism between gene and centromeric environment and/or centromere expanding and spreading. This study revealed abundant new genes in the pericentromeric regions. These new genes may contribute to new phenotypes and deserve further study. 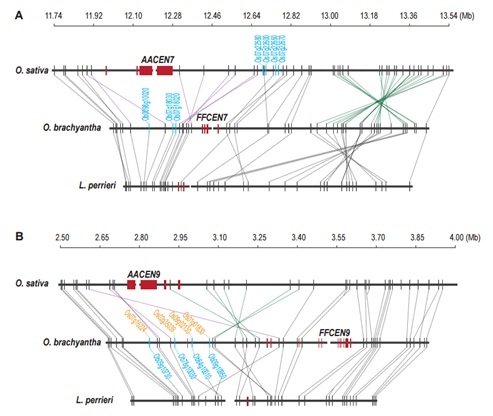 This work entitled "Comparison of Oryza sativa and Oryza brachyantha genomes reveals selection-driven gene escape from the centromeric regions" was published on-line July 2, 2018 in The Plant Cell (DOI:10.1105/tpc.18.00163). This research was funded by the National Natural Science Foundation of China.